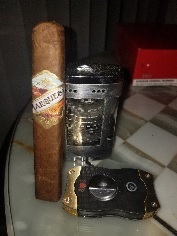 I would like to preface my review to say that I am very surprised I am reviewing a Gurkha. Don’t get me wrong, I like some Gurkhas, but not enough of them to write a review. 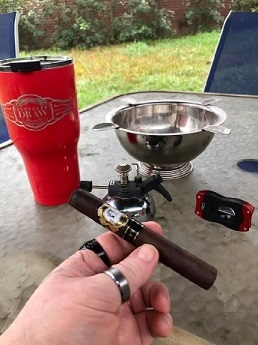 When I stopped by the Gurkha booth at Stogiefest 2019 in Jacksonville FL, I heard the rep say Sumatra. That was enough for me to pay attention to this cigar. It was an easy sell for me, so he put one in my bag. I smoked the cigar at the event and liked it a lot. So much so that I ended up buying a box of them. 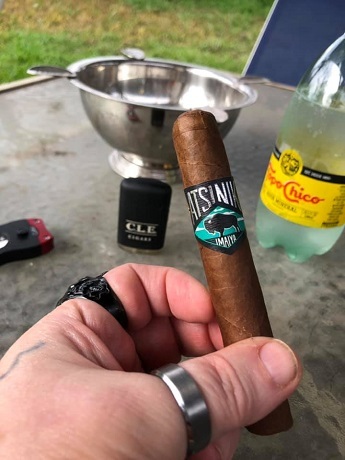 I sat back and enjoyed it where I could pay closer attention to the cigar’s flavor profile. I will enjoy this cigar with some Glenlivet Founder’s Reserve. Now, the review! For Catholics, Lent is a time of fasting and meditation leading up to the Easter holiday. Central to the tradition in modern times is refraining from eating meat on Lenten Fridays. 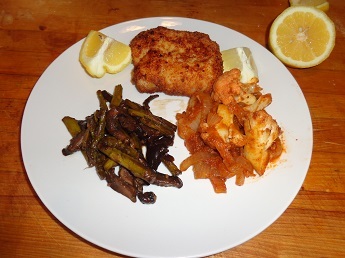 If you are like me and on a low-carb diet, Lenten Friday meals can be a challenge. In normal times, a bread dish, (such as a cheese pizza), a pasta dish (take your pick), or even fried fish from the local parish are all off limits to the low-carb dieter. The breading on the fish has a considerable amount of carbs and the hush puppies and fries are all carbs. With that in mind, I took up the challenge and made a Lenten Friday meal that was delicious to even non-dieters and fell within the strict low-carb guidelines (which, for me, is fewer than 20 grams of carbs a day, less than the sugar most people would add to their morning coffee). As I inspect the construction of this cigar, I am drawn to how tiny the vein structure is within the wrapper leaf. I've had cigars with big veins in the wrapper and I've had cigars with hardly any veins in the wrapper leaf. This one is different from any other I've seen. There is a slight coffee and leather aroma from the foot. This is a healthy robusto cigar and I expect it to deliver a volume of smoke with a slight draw. The pre-light draw confirmed that this was going to be the case. 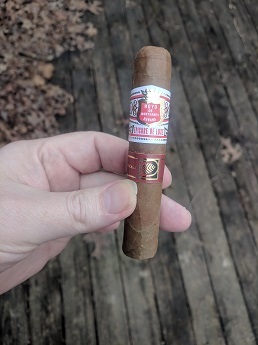 Upon lighting the cigar, I drew smoke that even if if had not been banded I would have immediately identified as a Hoyo de Monterrey. From the first draw, the leathery flavor profile of Hoyos was up close, personal, and lots of it. There is no harshness as is common on the first few draws of a cigar. The leather flavor practically slaps you in the face. The aroma is of very strong tobacco, which is exactly what I expected. Even though it wasn't harsh to begin with, the flavor smooths out even more in the first inch. Hints of coffee begin to present themselves. The cigar continues to produce volumes of smoke at the slightest draw. This cigar has a very smooth dark wrapper and a firm box press. The burn is perfect as is the cold draw. This afternoon’s beverage is a cold Topo Chico. 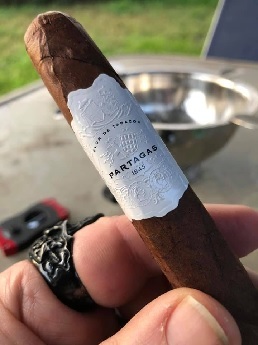 The cigar begins very mild with basic tobacco and cedar notes. There is a very light pepper note in the retrohale. The burn is very even. In the first third the draw has opened up and the cigar is burning a bit warm. The flavor profile has taken on a sharpness. The burn has started to canoe. During the second third the burn remains an issue, even after two touch ups, but starts evening out the slower I smoke. The flavors remain consistent and the smoke is very smooth. The cigar has developed into a much more medium body. The retrohale is very smooth. This cigar has a very dark smooth oscuro wrapper. The bunch is firm. The wrapper and foot have the heavy aromas of an oscuro. The cold draw is perfect. This morning’s beverage is a Chameleon Cold Brew Pecan. The initial flavors are mostly Black Cavendish and Burley, much more like a pipe tobacco. The retrohale is very smooth. The burn is mostly even. It’s pairing perfectly with the coffee. In the first third the smoke settles into a more traditional oscuro with earth and leather in the flavor profile. There is a very light cocoa note in the retrohale. The burn remains fairly even.